It’s that time of year when we want to spruce up our homes for the holidays! 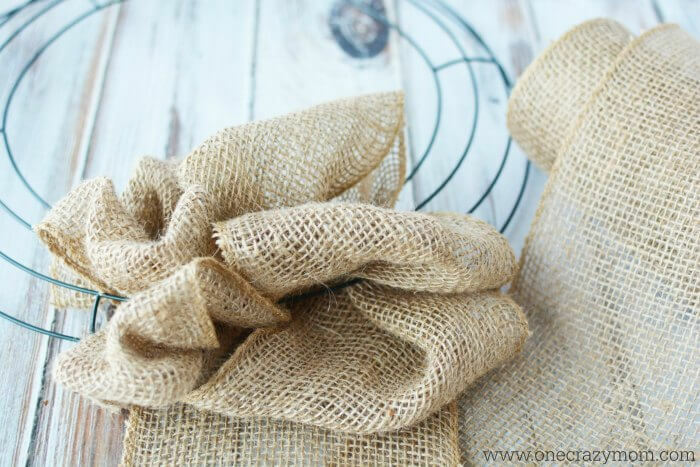 We are going to learn how to make a burlap wreath for Christmas and it is so simple to do. I love easy wreath ideas and this one is very simple. It turns out so pretty and you can easily customize it to suit your taste and home decor. Once you have the base down, it’s all just adding accessories! This idea is so easy to put together and turns out gorgeous. The cool thing about this wreath idea is once you know how to do the base, it is easy to make this for any occasion or holiday. We have another easy DIY Burlap Wreath idea you can make for under $15. This wreath starts out with a basic wire wreath frame. You can pick these up at your local craft store or I like to order mine on Amazon. Burlap ribbon is the base and it really makes it nice and full. And if you don’t already have a hot glue gun, you will need one of those to attach the berries and pine cones. I have a regular size one and also a mini one that I love. (You can see several here). 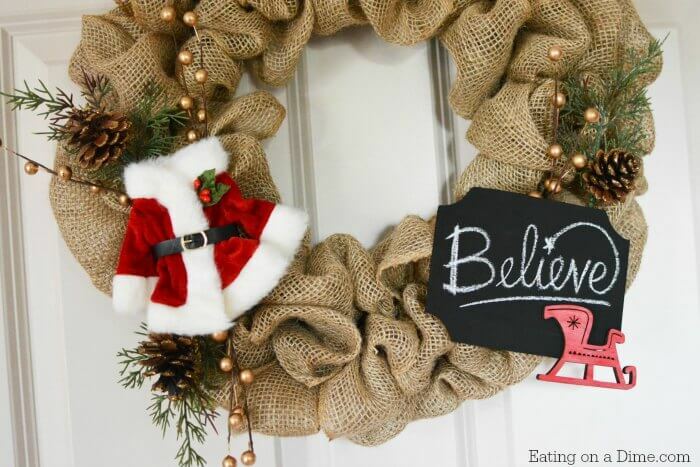 The Believe sign is really darling on the wreath. You will need a little chalk paint to complete this look. I keep this paint on hand because I use it for so many projects! 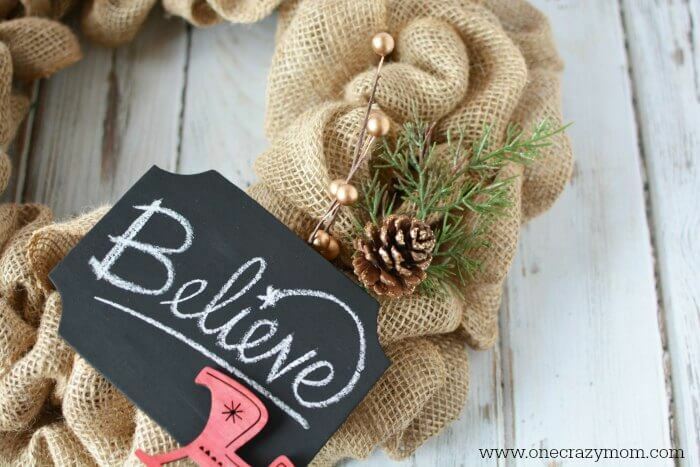 Let’s get started making Christmas burlap wreaths! You are going to love how this burlap wreath turns out. Your front door will look so festive with this Christmas wreath. 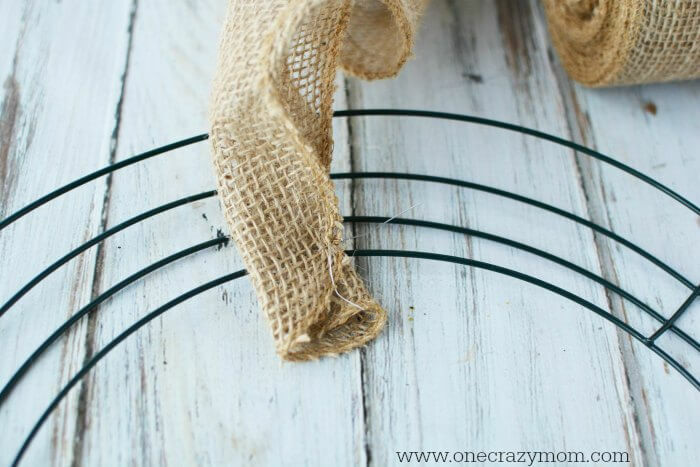 We will learn how to make a burlap wreath with wire frame with ties! 1. 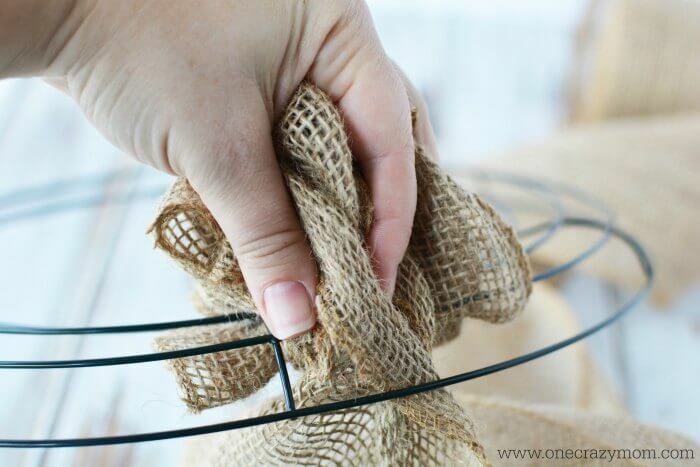 Place your wreath form onto a flat surface and fold one end of your burlap in quarters. Slide a small piece of wire through the end and attach it to the inside portion of the wire frame by twisting it on tightly. 2. Begin to weave the burlap into each section of the frame. Start from the inside of the frame and move to the outside. 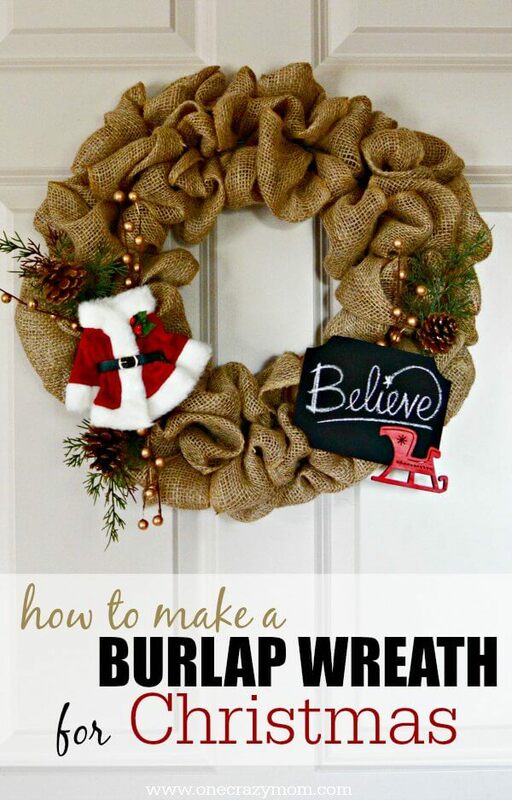 As you put the burlap into each section of the wreath form, pucker it out so it forms a bubble. 3. Once finished, grab the 3 loops and squish them together in your hand. Flip over the wreath so you are now working on the back of the frame. Twist the loose end of the burlap 3 times, and push the burlap through the sections of the wire frame again. 4. Repeat the process of scrunching, holding and twisting the burlap. I placed 3 sets of burlap loops into each of my 6 sections on my wire frame. 5. As you repeat this process, look at the wreath and fluff the burlap, making sure the loops are about the same size and look okay. 6. When you are finished, cut the burlap if necessary. Fold the end in quarter just like you did initially. Slide a small piece of floral wire onto the frame and affix it to the frame by twisting tightly. 7. Add the santa suit by attaching with hot glue. Tuck in some pine cones and gold beads. 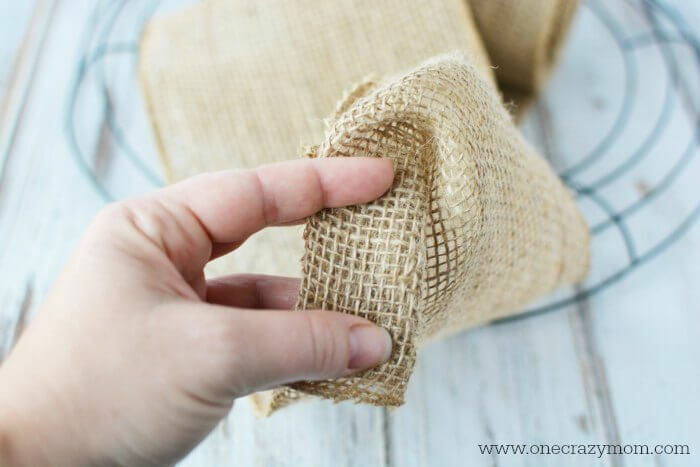 Attach with hot glue or simply weave into the burlap. 8. 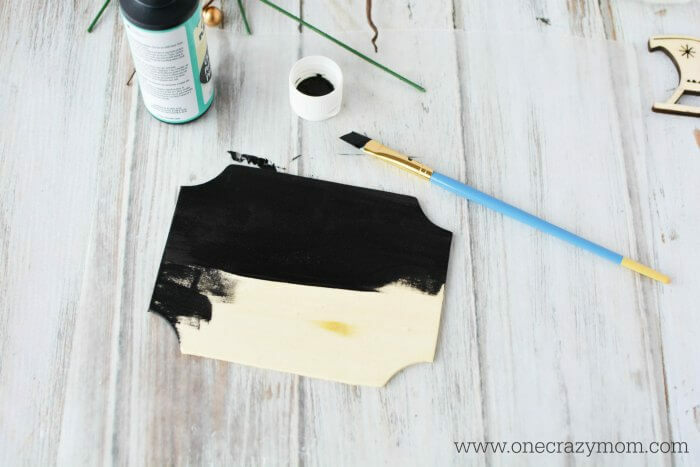 Paint the wood sign with 2 coats of chalkboard paint, letting dry between each coat. 9. 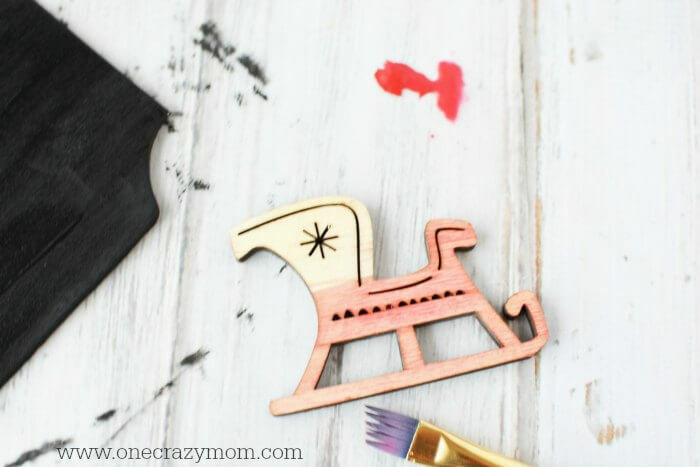 Add water to red acrylic paint to lightly wash the wood sleigh cutout. Let dry completely. 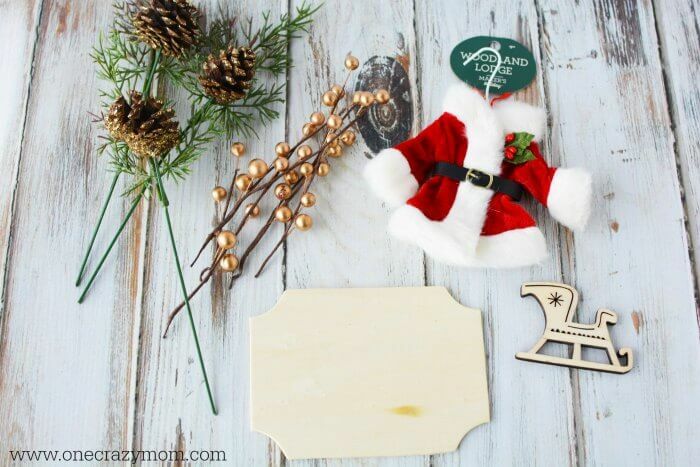 Attach the sleigh to the sign with hot glue. Attach the sign to the wreath with hot glue. Write on the sign with chalk. (Believe, Joy to the World, Be Merry, etc). Tuck additional pine cones and gold berries around the sign. It is that simple to make your own Christmas wreath! 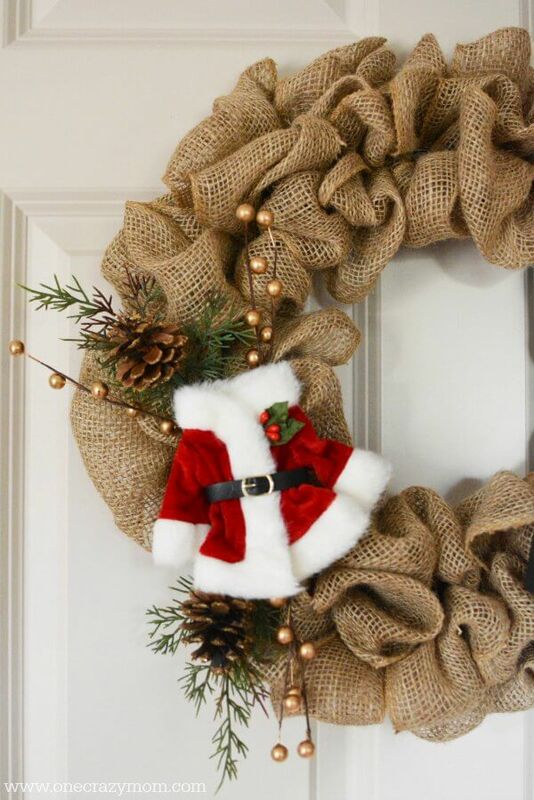 This Christmas burlap wreath will look so festive displayed on your front door. 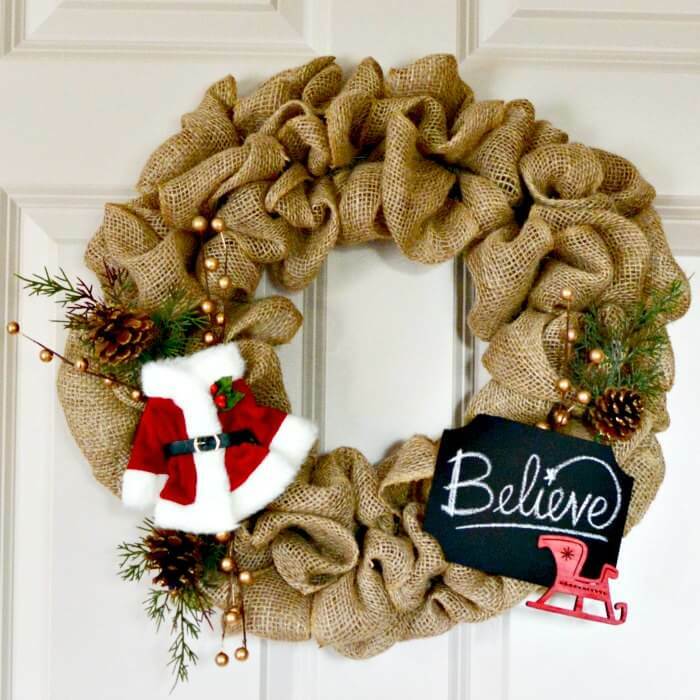 What is the best way to hang this Burlap Christmas Wreath? You can use a nail to hang the wreath but I prefer to use wreath hanger. We have one of the wreath hangers and I like it because I can easily move it. It doesn’t mess up the door and it’s simple to take off. Now that you know how to make a Burlap Christmas Wreath, you will love making wreaths for the holidays! This is such a fun and inexpensive way to make your home festive. 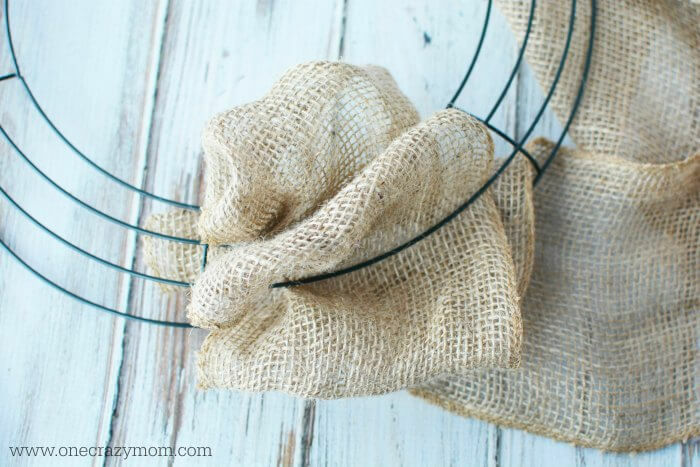 There are many different ways to make a burlap wreath, but this seems to be the most simple. You are going to love how much money you save by making your own wreaths. Burlap wreaths are so versatile and you can do many different colors and styles. How to make a burlap wreath with two colors? Simply alternate each loop with a different color. Select the two colors you prefer and alternate. Now that you know how to make a ruffled burlap wreath, try one for every season! They are so inexpensive to make and much cheaper than anything you could buy in the store. If you are curious how to make a red burlap wreath, it is so simple! Just follow the exact same instructions but use red burlap instead. Easy! 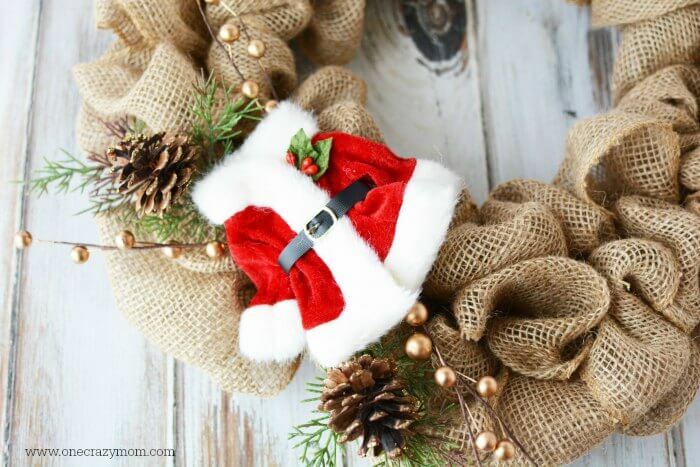 Let us know how your DIY Christmas Burlap Wreath turns out! I love how you can customize these wreaths to suit your taste and decor! Looking to jazz up your holiday decor on a budget? Try this DIY Dollar Store Christmas Candle Holder that takes only minutes to make and leaves a festive glow for your home. 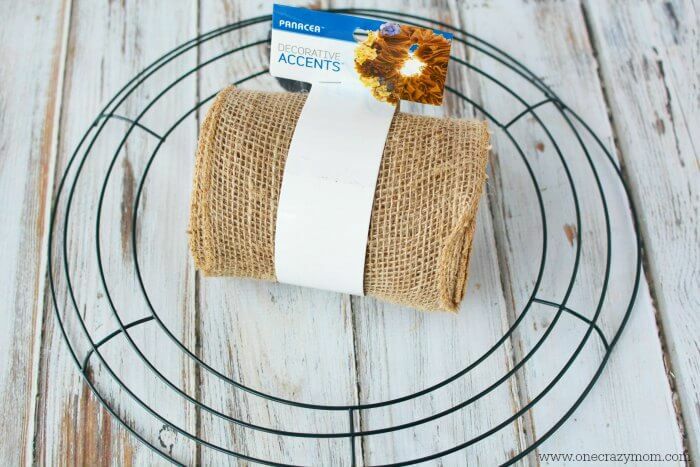 Learn how to make a burlap wreath for beginners with this DIY Burlap wreath for under $15! 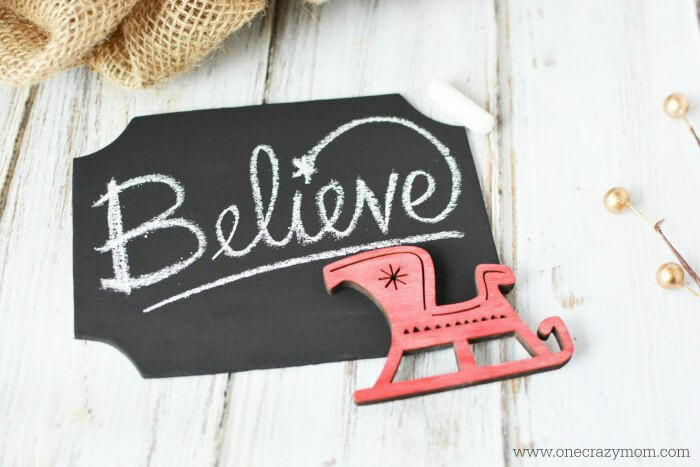 Find 20 of the best Christmas craft ideas for children. These are perfect for kids of all ages, and are super easy to make!